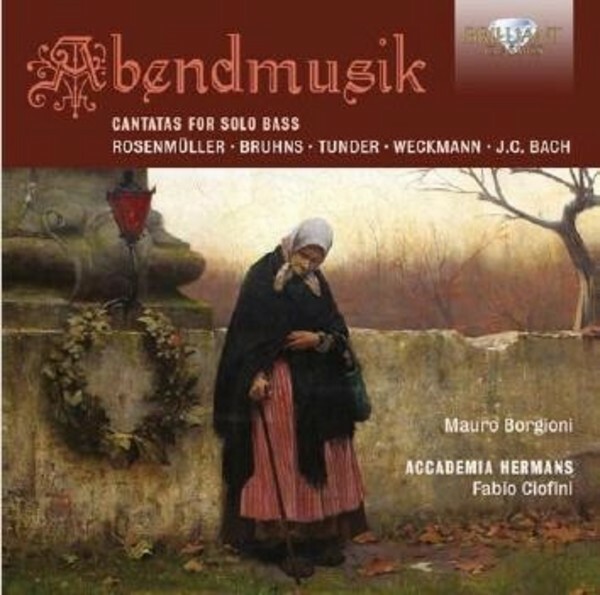 In late 17th century Germany, the Abendmusik (Evening music) was a social evening gathering of citizens in the church, accompanied first by an organ recital, later developing into more substantial sacred concerts, focusing on the genre of the Cantata for solo bass and ensemble, the severe and evocative timbre of the bass being a perfect expression of Lutheran doctrine. This new recording features Bass cantatas by Johann Christoph Bach, Tunder, Rosenm�ller, Bruhns and Weckmann, with instrumental interludes of sonatas by Krieger and Schop. The impressive and sonorous bass of Mauro Borgioni is accompanied by the Accademia Hermans, an Italian Early Music group, led by Fabio Ciofini, featuring violin, viola da gamba, cello, theorbo and organ. Excellent liner notes are included in the booklet, as well as the full specifications of the historical Hermans organ of 1678.